Which Sports Properties Have the Highest Relevance in the Gaming Community? The recent explosion of eSports entertainment over the last few years has led to the rise of emerging eSports and traditional sports affiliate teams. Some sports leagues, such as the NBA, have already taken steps to capitalize on this growing genre. Towards Spring of next year, we can expect to see the NBA’s 2K league take off in May under the tutelage of Brendan Donohue (@2KLeagueMD). Unfortunately, not every sports executive is jumping at the chance to coopt an eSports team with their club’s branding. Bob Bowlsby, the Commissioner of the Big 12, is just one league executive that has been critical of the legitimacy of eSports. Although many dispute the athletic abilities of eSports athletes, few can argue the money-making potential that exists in the up-and-coming genre. For example, Twitch is one of the most popular eSports streaming platforms out there, and for good reason: Twitch sees 15 million users a day with 35% of those users viewing streams on a mobile device1. There is a wealth of tech savvy users watching eSports that could be converted to traditional sports fans if an authentic connection were developed between sports properties and these users. The question remains, how do we know which traditional sports properties or leagues will resonate best with these eSports fans? 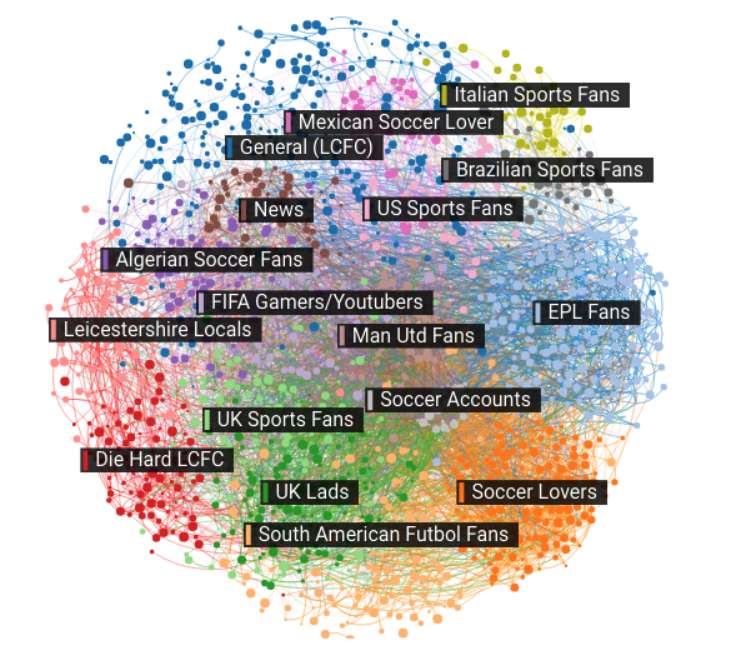 I utilized the Affinio Data Intelligence Platform to look at the social media usage of American gamers and eSports fans, and from that data was able to see which sports leagues were most relevant to them. Below, you’ll see a chart that denotes the relevance and affinity levels of a variety of international sports leagues and organizations as they pertain to gamers and eSports fans. The Relevance score measures an interest’s significance to an audience using metrics based on its Affinity score, audience size, and the number of members who already have this interest. The Affinity score shows how many times more likely an audience is to have an interest in an individual property as compared to the entire social network they interact with. You can see based on the graph below that the NFL is the most relevant sports league to the gamer community, however they do not have the highest Affinity score. 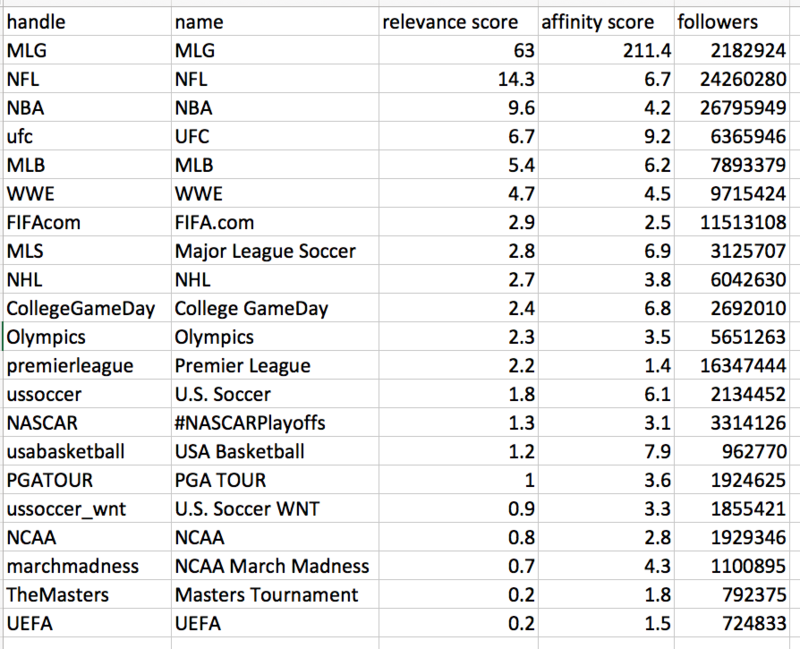 The UFC, USA Basketball, and MLS all have higher Affinity scores. By looking at this data, it would appear that gamers are drawn to sports that have popular video games licensed under them. Many deductions or assumptions could be made from this data; however, the glaring numbers show that the NFL and NBA have the most significant reach with the gaming community. Understanding how to capitalize on the rise of eSports could potentially lead to massive growth in traditional sports viewership. If 35% of Twitch users view content on their mobile devices, imagine if they became NBA fans? You then have hundreds of thousands of tech savvy users that could potentially buy NBA League Pass and view games on their phones. Developing an authentic association with eSports leagues through co-branding and licensing could yield immense returns for traditional sports leagues. This blog post was written by Samford University student Chase Tripi (@TripiSports).